Due to an upgrade and switch over to a new online booking platform, you may experience some disruption if trying to book the following activities online from 3rd to 6th March. TreeZone Aerial Adventure Course Segways at Aviemore Archery at Aviemore In the meantime you can still check availability and book by calling the Rothiemurchus Visitor Centre on 01479 812 345 (during office hours) or email to fun@iye.scot (out of office hours) The disruption will be from midnight on Sunday 3rd March to Wednesday 6th March 2019. Sorry for any inconvenience that may be caused by this. In addition to the scheduled activities on offer at Loch Tay Highland Lodges, we also offer Katakanu Hire (for up to 6 people). For the first time we are offering online booking for our hire service and you can find out more and book online below. We're very excited to announce that we will be offering activities at Loch Tay Highland Lodges in 2019. Scheduled activities are now available to book online, with the first sessions being available from 9th February. We will be based at the awesome Loch Tay Highland Lodges, on the shores of Loch Tay and a short drive from Killin. We'll be offering Archery, Segway Experiences and Canoeing to start with, then WOW (Walk on water balls) and family-friendly Gorge Walking as the season progresses. 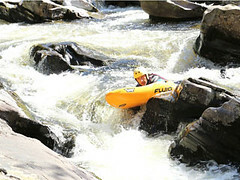 We also plan to schedule some very exciting Whitewater Sledging sessions at the awesome Falls of Dochart in Killin. If you've driven over the bridge into Killin, you can't miss them! Activities are available to book for both guests staying at Loch Tay Highland Lodges as well as those people staying elsewhere in the area or just passing by. We can also take private group bookings by prior arrangement and subject to availability. You can find out more and book online at our Loch Tay Activities page. We hope to see you soon. If you're anything like us, it's often at this time of year you might start planning your adventures for the following year. You may be new to canoeing or an experienced paddler looking for ideas about where to go and how to go about organising an adventure of your own. Here are some of our favourites to help inspire you to your next mini-adventure. You can click on the images to open/ print a pdf document. We are looking for a Ropes Course Manager to run our TreeZone course at Loch Lomond Shores, Balloch. This following information pack will hopefully be of use in helping you to decide if we are right for you and you are right for us. If you would like an informal chat about the position or the company then please call 0333 6006008 and ask to speak to Mike or Brenda. 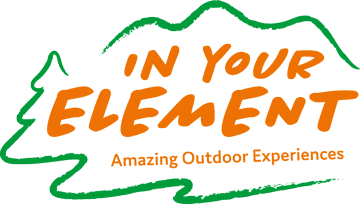 TreeZone is the name of the two high ropes adventure parks operated by Wee Westie Ltd, trading as ‘In Your Element’, an award-winning multi-activity adventure business with bases throughout Scotland. Applications: A CV with accompanying covering letter (outlining why you would be a great addition to the IYE management team) should be e-mailed to mike@iye.scot by 5.00pm on Friday 23rd November. Interviews: Interviews will be held on site at TreeZone Loch Lomond (postcode G83 8QL) on Tuesday 4th December. Start date: Start date is negotiable, but would ideally be around 19th January 2019. It's that time of the year again, and as the winter approaches, we're starting to close things down at Loch Lomond Shores beach. The team will be removing the equipment fromthe beach to put into storage. From next week the following will not be available from the beach area at Loch Lomond Shores, Balloch: Canoe hire Katakanu and pedal boat hire Bike hire Segways tours Please also note that we have taken the decision not to offer these activities from the beach in 2019, but will concentrate our efforts on our core business, which includes TreeZone, canoe or kayak hire and our wide variety of guided activity options, e.g. gorge walking, river sledging, canyoning, canoeing. The following activities are still available to book throughout the winter and into next season: TreeZone Loch Lomond Pre-booked canoe hire (minimum of 1 full-day hire) Pre-arranged private group activity bookings, e.g. canoe trips, Highland Games, archery, Gorge walking and river sledging. If you have any questions about any of our activities or would like to enquire about booking something, do get in touch. Calum on Where’s the water? Neil Warren on Where’s the water? © Copyright 2018 In Your Element. All rights reserved.